We lived 200 miles from our Hill Country site, and with every pre-construction visit, Jim Rutherford pressed us to switch from the paint we requested to what he described as the best paint and warranty — Sherwin-Williams top-of-the-line Duration paint with a lifetime warranty. 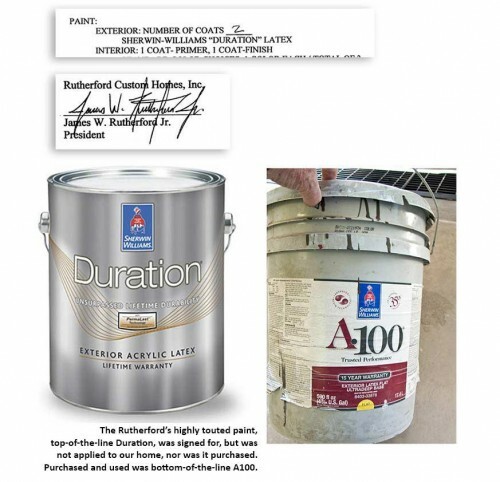 We finally agreed, and Rutherford Custom Homes’ president, James W. Rutherford, Jr., (Beau Rutherford) wrote 2 coats of Duration paint into our contract’s materials specifications. We had huge, long-lasting paint issues throughout the building process, inside and out. CLICK PHOTO TO ENLARGE. CLICK X TO EXIT PHOTO. 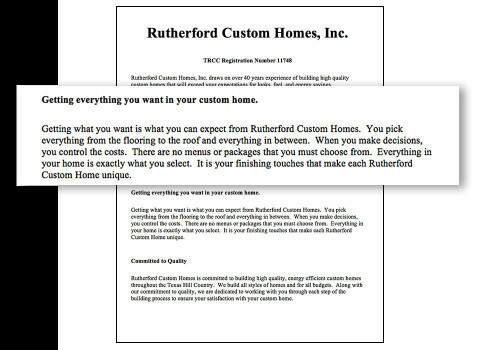 Rutherford Custom Homes' website advertised: Everything in your home is exactly what you select. We found their claims to be false advertising. 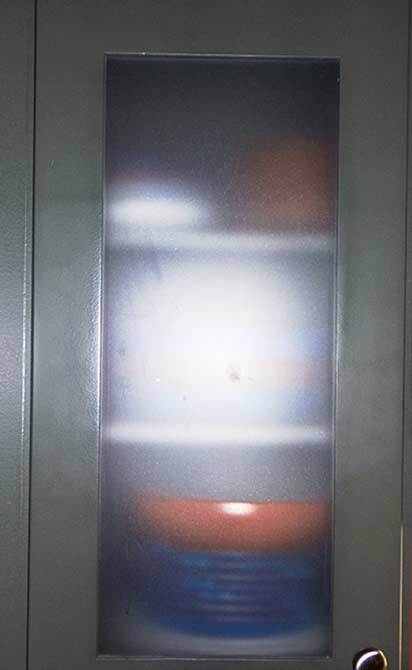 Inside, all our built-in wood cabinets, desks, bookcases and work surfaces looked horrible and scratched so easily, we couldn’t put upright magazines in the bookcases because the paper covers would strip off the paint. In the kitchen cabinets, cups, plates, pans etc. would gouge the paint. Our work surfaces, bookcases and kitchen and office cabinets were unusable. The builders did make some efforts to correct the inside paint, sending in their painters a few times. But the painters didn’t finish and didn’t return after July 1, 2009. There still was much to be refinished. By that time, the builders had been avoiding our calls and emails as the then-historic Texas drought had broken and we had roof leaks, door leaks, more than 10 windows leaking, plus numerous items to be done on the To Do lists. Outside, the paint looked dull, unlike any paint we’d used in the past or seen. 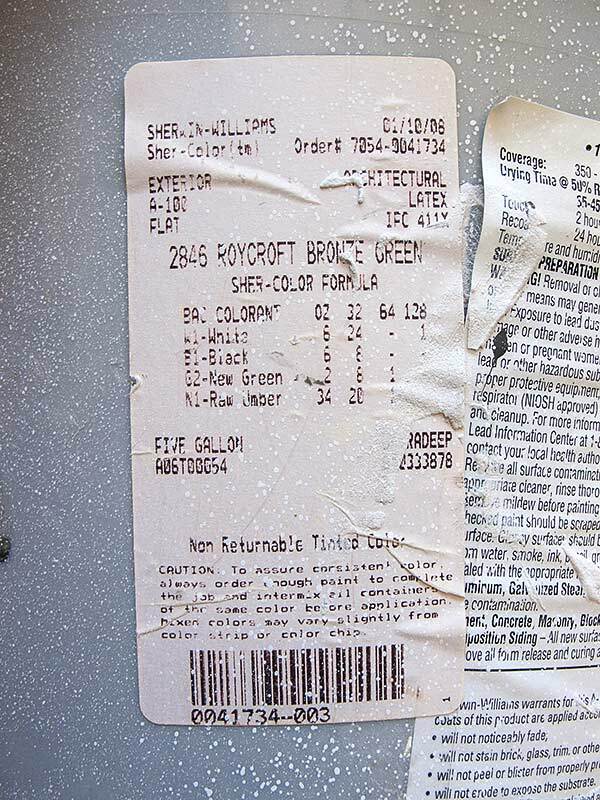 Two Sherwin-Williams managers, one from the store where the builder bought his paint, and one from a store in another town, inspected and tested our paint. Wrong paint was used and too-little paint was used for the surfaces, both managers concluded after visiting, testing, and measuring our home. Turns out, bottom-of-the-line paint was used. 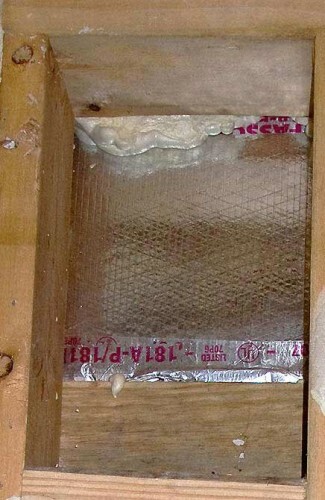 And on the wood work surfaces inside, both managers said latex was used rather than enamel. 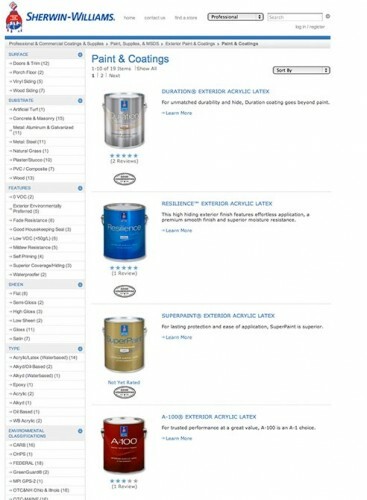 Beau Rutherford did not produce the paint store documents requested in our lawsuit. Neither he nor his mother, Carolyn H. Rutherford, Rutherford Custom Homes’ Secretary/Treasurer, produced the documents over 2 years. 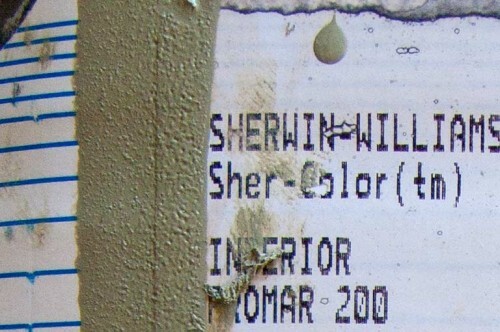 We obtained the records from Sherwin-Williams directly through legal means. 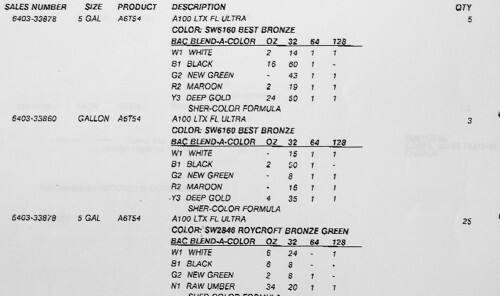 The paint for our home was not bought by Rutherford Custom Homes, it was purchased by JW Rutherford Builder, Inc. J.W. Rutherford Builder, Inc. was owned by James W. (Jim) Rutherford, Sr., according to testimony by his son, Beau. At the time, the President of J.W. Rutherford Builder, Inc. was Carolyn H. Rutherford, the same Carolyn Rutherford who was Secretary/Treasurer of Rutherford Custom Homes, our builder. JW Rutherford Builder, Inc., did not purchase our contracted top-of-the-line Sherwin-Williams Duration paint that Jim Rutherford promised and Beau Rutherford wrote into the contract specifications, and signed. Left-over paint cans with a Sherwin-Williams sticker and mix code showed bottom-of-the-line paint used. 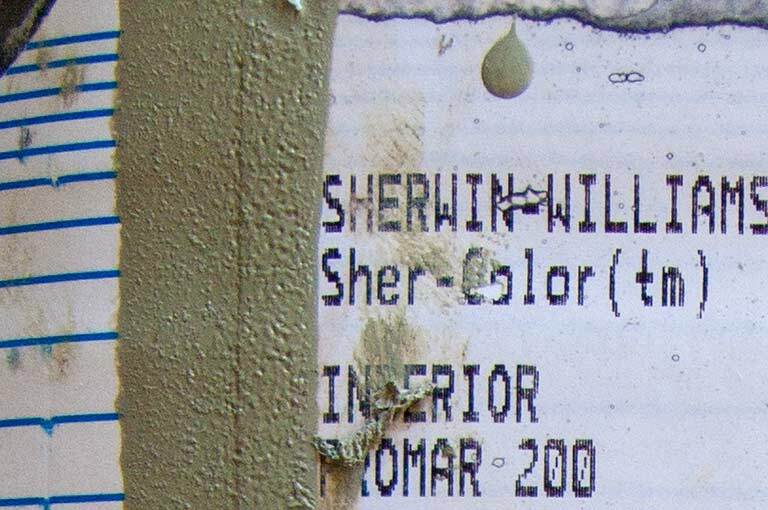 That was verified by the 12 pages of paint invoices from Sherwin-Williams, the documents the Rutherfords did not submit to the court. A multitude of paint problems never were resolved over many months, despite meetings with the builders and the paint store manager. Jim Rutherford talked us into top-of-the-line Duration paint. Beau Rutherford signed that we would get Duration paint. Carolyn Rutherford’s other company bought the paint. But the paint in the contract and the paint used were far from the same. Q: Do you ever recall receiving from the Roses any information about defects in the paint? Q: Is it your testimony that you used the quality of paint specified in these documents pertaining to this project? A: The quality of that paint or better. 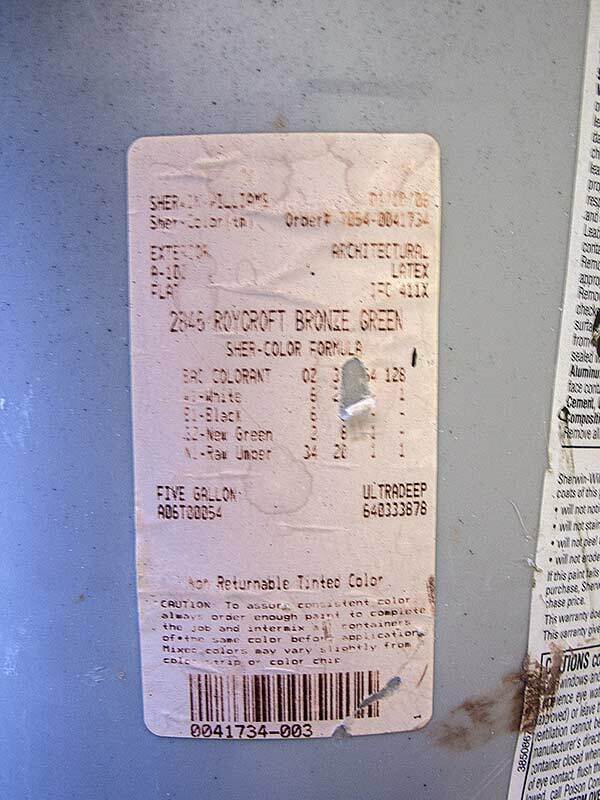 Builder James W. Rutherford Jr., (Beau) promised top-of-the-line Duration paint vs. what was used. Drywall removal found no insulation here either. Builder's switch paint, top. We later applied contract paint, bottom. 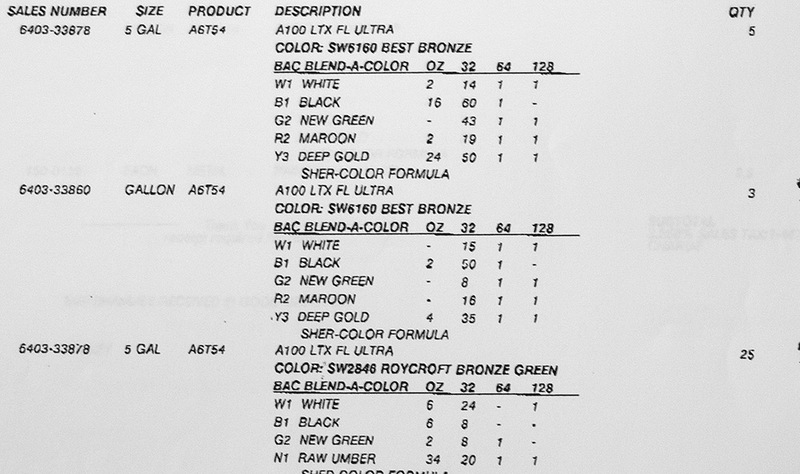 Not a drop of Duration on our Rutherford Custom Home's 12-page paint store invoice. More cans with the switch -- bottom-of-the-line paint . A100: 5-gallon cans left of our paint, Roycroft Bronze Green. Builder purchased bottom-of-the-line A100 paint. 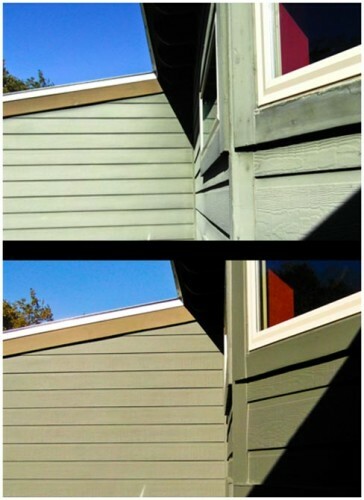 Top: Rutherford Custom Homes' promised paint. Bottom: A100 used. First: Duration. Last: Promar 200 used. Bottom-of-the-line paint used inside our Rutherford Custom Home. Another company bought our paint. Carolyn Rutherford was president of JW Rutherford Builders, Inc.
Carolyn Rutherford had these bookcases repainted correct color, all red. Paint and some of our products were purchased under this other family company, JW Rutherford Builder, Inc. We were unable to determine why our paint and some other products were bought by this other company, but Beau Rutherford testified he was working for that company, at least by the time of his deposition. As both companies were owned by Rutherford family members, it seems that should not have affected our getting the paint Rutherfords’ stated in our contract that we would get. Q: What – what is the nature of the work you are now doing for JW Rutherford Builder, Inc.? Q: Do you know who the owner of JW Rutherford, Inc. is? Q: Is that your father? 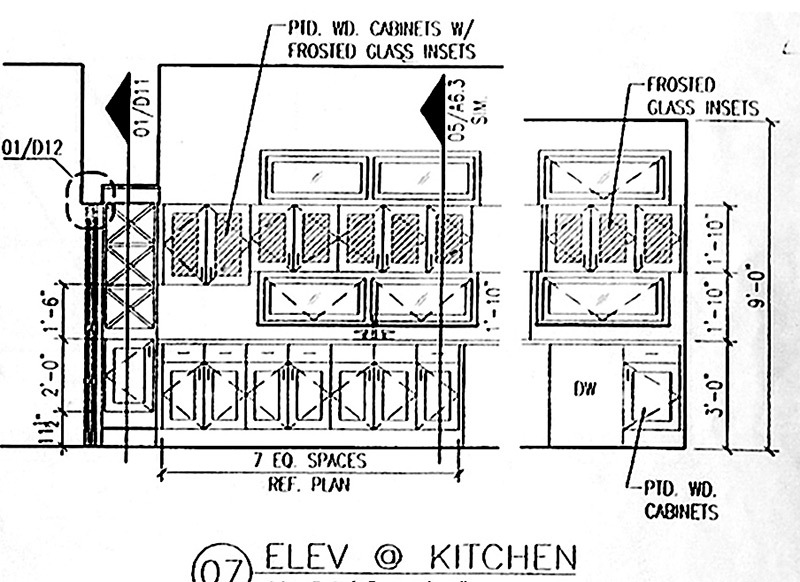 Our plans explicitly called for glass in the kitchen cabinets. On a visit to the site, we saw that plastic, not glass, had been put nto the cabinet doors. 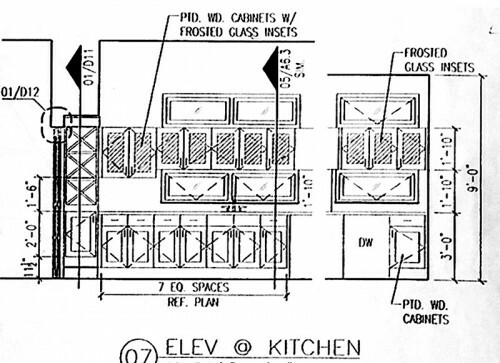 Rutherford Custom Homes ignored plan, substituted plastic for frosted glass. Plastic, not glass, was installed in cabinets. Builder concocted excuses, later-refuted by glass firm. The back and forth with Jim Rutherford, then adding glass to the To Do list, brought excuse after excuse. The issue was not resolved by the builder by the time we terminated Rutherford Custom Homes. 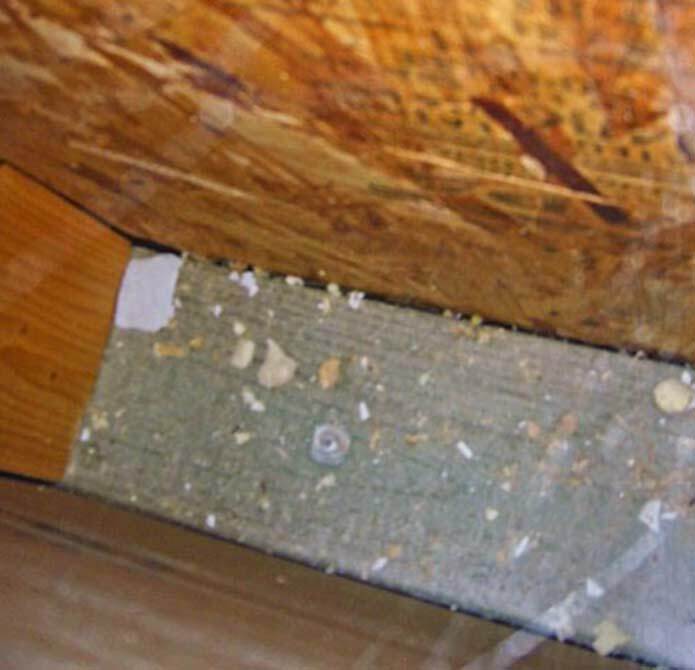 When we later contacted the glass company, the owner said he wondered why anyone would have ordered plastic for the cabinets, as plastic scratches. But that was what the builder ordered, he said. The supplier did good work for us, not just in replacing plastic with the glass we ordered, but during construction of our floor-to-ceiling glass foyer, the glass man went out of his way to craft flashing for the glass walls as the builder was not going to do so. Ten months after we had paid for our home and moved in, the builder still had not paid off the glass company. 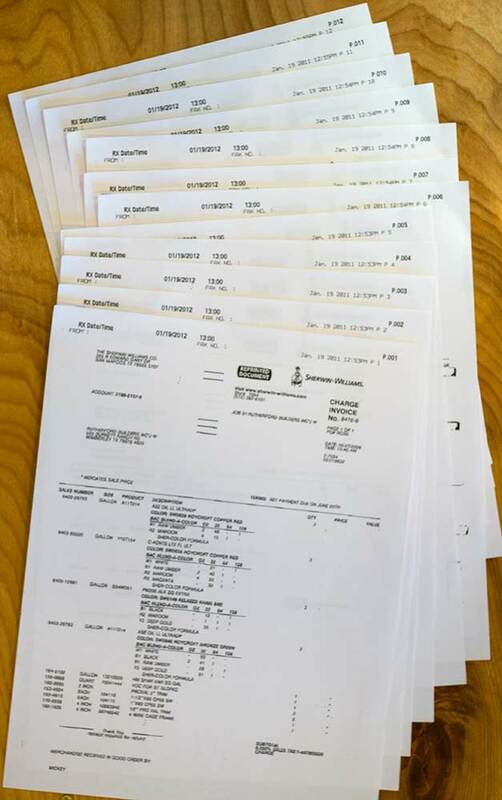 We found out the builder owed the glass company thousands of dollars, despite the fact that we paid the builder for the glass in full — more than a year earlier. Building insulation specifications signed by James W. Rutherford Jr. (Beau Rutherford). 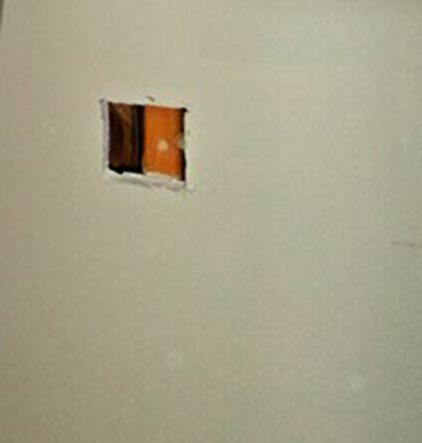 Hole cut in wall to insert a tiny camera and check insulation problem. 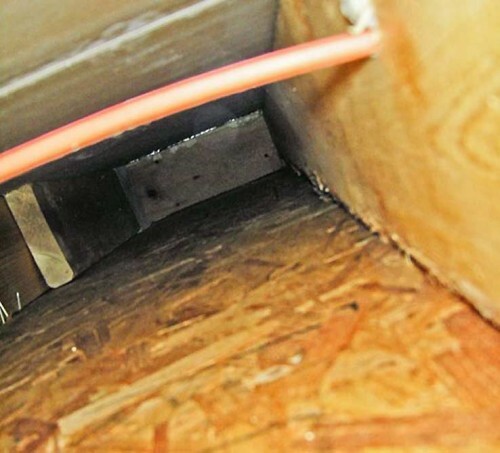 Camera found no insulation in wall. Another hole to check Rutherford Custom Homes insulation. Camera pointed up, found no insulation in this wall either. 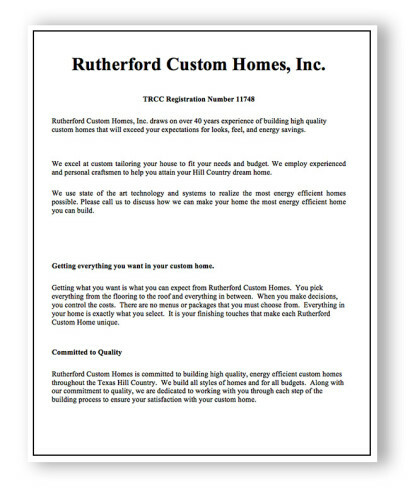 From website: Rutherford Custom Homes, Inc., James W. (Beau) Rutherford, Jr., president. 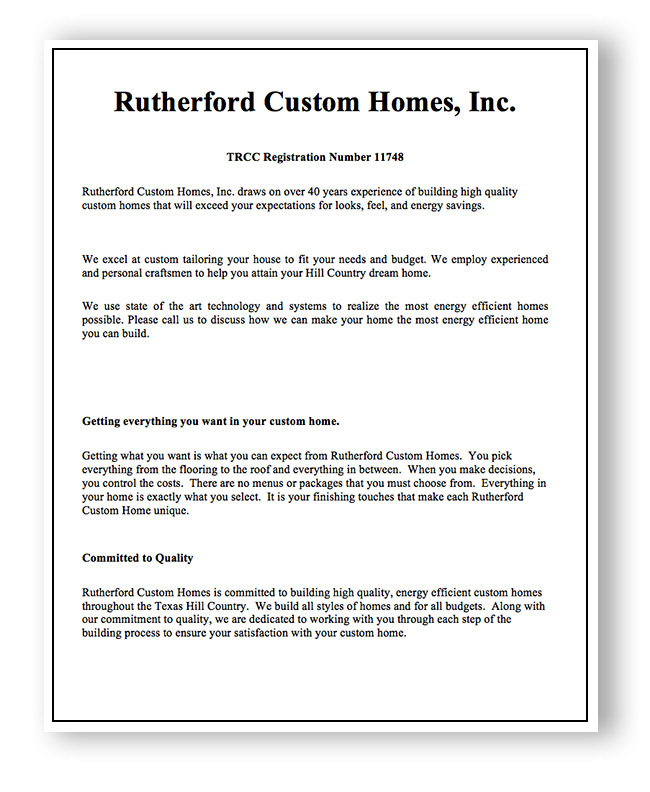 “Rutherford Custom Homes, Inc. draws on over 40 years experience of building high quality custom homes that will exceed your expectations for looks, feel, and energy savings. “We excel at custom tailoring your house to fit your needs and budget. We employ experienced and personal craftsmen to help you attain your Hill Country dream home. We use state of the art technology and systems to realize the most energy efficient homes possible. Please call us to discuss how we can make your home the most energy efficient home you can build. Getting everything you want in your custom home. 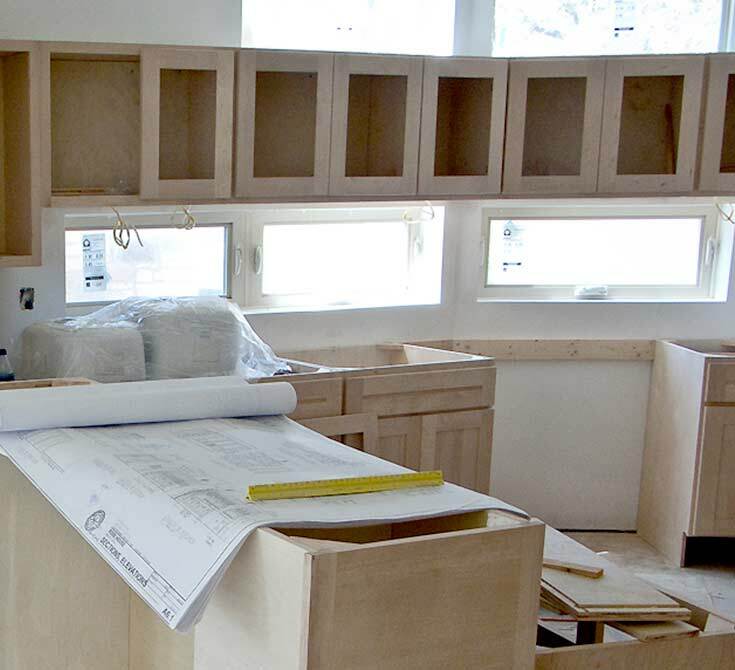 Getting what you want is what you can expect from Rutherford Custom Homes. You pick everything from the flooring to the roof and everything in between. When you make decisions, you control the costs. There are no menus or packages that you must choose from. Everything in your home is exactly what you select. It is your finishing touches that make each Rutherford Custom Home unique. Rutherford Custom Homes is committed to building high quality, energy efficient custom homes throughout the Texas Hill Country. We build all styles of homes and for all budgets. Along with our commitment to quality, we are dedicated to working with you through each step of the building process to ensure your satisfaction with your custom home. 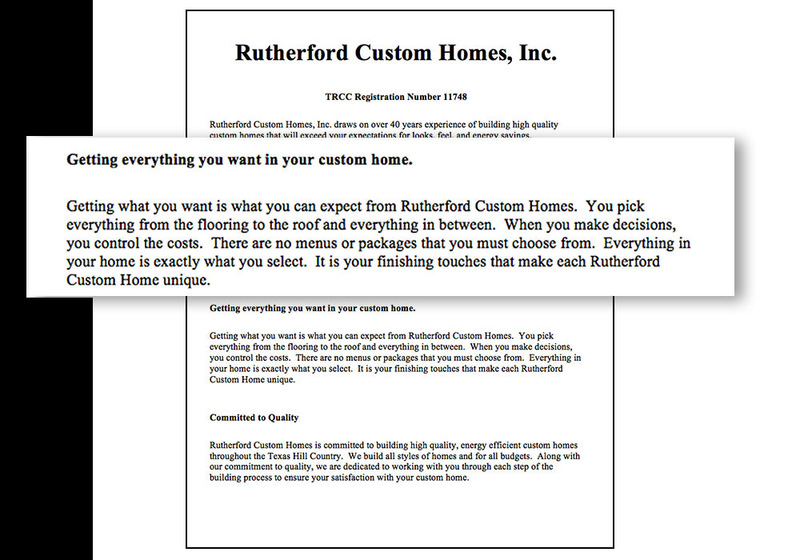 * Absurdities in the Rutherford Custom Homes’ website, underlined by us.